Coma Berenices lies between Leo and Bo�tes. Very faint, the constellation requires optimum conditions to study, time fully rewarded as this is the home of the superb �Coma Star Cluster�, one of the finest binocular objects in the heavens. The eight Messier objects in Coma Berenices require medium to large telescopes, as do other galaxies which are nearly as impressive. 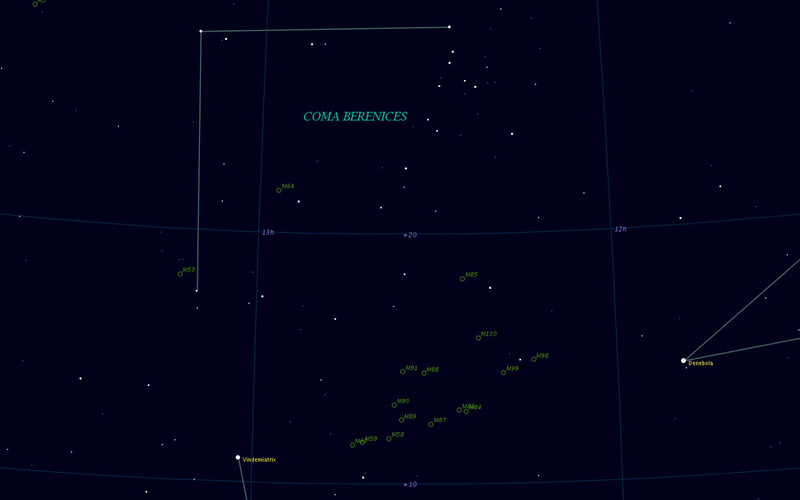 Besides the Coma Star Cluster, Coma Berenices contains several very nice binaries suitable for binoculars. To locate alpha Comae draw a line between Denebola and Arcturus, nearly due east. Alpha is midway along this line, two FOVs west of Arcturus. Alpha Comae Berenicis is a very close binary of equal 5.1 magnitude stars. Together they form a magnitude of 4.3. The companion's orbit of 25.9 years is seen perfectly on edge. Alpha Comae is quickly found west of Arcturus. Follow the arrow-shaped asterism -- in the same FOV as Arcturus -- which points directly to alpha Comae, two FOVs to the west. The Messier object in the same field of view, M53, is a globular star cluster about 65,000 light years away. It's best seen in large telescopes. Beta Comae Berenicis is two FOVs north of alpha. From beta, move your glasses due west two fields and you'll find the magnificent glittering spectacle known as The Coma Star Cluster, that completely fills the binocular field of vision. Though Gamma Com is the star furthest north; it isn't a member of the cluster. Gamma Comae Berenicis forms the western tip of the constellation's asterism. More interestingly gamma Com is in the vicinity (although not apparently a part of) the delicate star cluster simply known as The Coma Star Cluster. Place beta Comae at the eastern edge of your glasses; two close stars (30 and 31) will be on the right side. Now sweep to the west, placing 30 and 31 at the eastern edge. Gamma and the cluster will be sitting on the western edge of your glasses. Move a little further to the west, gathering up all the stars of the cluster. The cluster perfectly fills the binocular FOV, making it a delightful object of study. Its stars are roughly 275 light years away, one of the closest star clusters. About forty stars form the group, the brightest being 12 Comae. Only a half dozen of the stars are 5th-magnitude, the rest being 6th- or even fainter. Altogether they form a dazzling effect in binoculars.